Milwaukee is most known for beer and cheese. Did you know that it’s biggest city got the name “Cream City” from brick? The name Cream City comes from a locally sourced brick that helped build the city of Milwaukee during the 1800s. The origin, composition, and influence around the world make Cream City brick an important part of Milwaukee history. Where did Cream City Brick Come From? Cream City brick originated along the Menomonee River Valley and Lake Michigan. Terry Pepper’s essay “Cream City Brick: The Brick From Which Milwaukee Got Its Nickname” illustrates that the location made it easily accessible to suburbs surrounding Milwaukee. Cream City Brick made its way across the country before it ceased production in the 1930s. From houses to businesses, Cream City brick birthed the progression of Milwaukee’s industrial ventures for nearly 100 years. You might ask, what makes Cream City brick different from any other brick? What Makes Cream City Brick Different From Other Brick? The banks of Lake Michigan and the Menomonee River Valley supplied the red clay with unique properties. The high amounts of sulfur and magnesium mixed with high heat turned the red clay into a cream-colored brick. If you look at the history of brick, it originated in the east over 10,000 years ago and remains as one of the most durable & sustainable building material. Countries took bricks and developed new styles, and the same goes for Milwaukeeans. 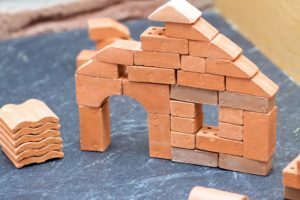 While a popular choice and trustworthy for building, there is some debate on how strong the brick was. In an article from WUWM, some builders opted for more traditional brick because it wasn’t as sturdy and had the tendency to turn black due to its high porosity. Debate aside, homeowners and business owners take pride in the preservation of the locally sourced brick. Are There Buildings That Still Have Cream City Brick? There are many landmarks in Milwaukee that still bare Cream City brick. The Trinity Evangelical Lutheran Church, located in downtown Milwaukee, was originally made from Cream City brick according to a nomination form for the National Register of Historic Places. The Schlitz Brewery Building Complex hosts a number of buildings that still have Cream City Brick. According to a post from Terry Pepper, the Old Mackinac Point Lighthouse in Mackinaw City, Michigan still bares Cream City brick. Cream City brick is an essential part of Milwaukee’s history. The brick has a longstanding place in Milwaukee’s development. 100 years after they ceased production, it’s remarkable that buildings are maintaining Cream City bricks presence. If you liked this post check out parts two & three of the history of brick! Are you trying to make your backyard an oasis? Do you enjoy landscaping projects hoping to upgrade your yard or garden? Or is your property sloping and have different elevations? There are plenty of different reasons to consider installing a retaining wall. Retaining walls aren’t just for holding back soil anymore. Many homeowners employ retaining walls to bring some architectural interest to their yards. And retaining wall design has come a long way from its utilitarian roots. A retaining wall can make all the difference in your outdoor space. Read on for our tips to make your retaining wall project a success. A retaining wall is a structural piece of your yard, but that doesn’t mean it can’t be attractive. When considering building a retaining wall in your yard, you need to choose the right material for your wall’s purpose. There are a few different options. If you’re not like Tim the Tool Man Taylor, you may need to go to your local big box home improvement store to rent the tools necessary to build your retaining wall. If you are doing a huge revamp of your yard and need to move soil around, you may also need to rent some heavy duty equipment, like an excavator or a skid loader. Unless you are construction savvy, you may opt to hire someone to do this type of preliminary work for you. It is extremely important to have a solid base for the wall. If the foundation is off, the wall is likely to be off as well. 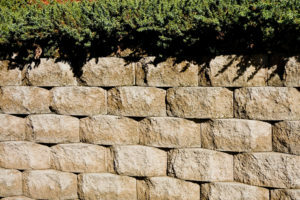 A crooked or slanted retaining wall will mean trouble in the long run. Dig out the base, tamp it using your hand tamper, and fill with gravel or whatever filler you’re using. Make sure it is compacted and ready for the next step. It will keep your wall nice and sturdy. If your yard has a slope, you will need to add drainage so that rainwater doesn’t puddle in one area. Use gravel and a drainage pipe at the base of your project. Cover the ends of the pipe with a mesh fabric to prevent the pipe from getting clogged. Start with your first layer of whatever material you chose. As you build the wall, you need to consistently check to make sure it’s level. You can use any number of decorative caps or edges to complete the wall. As you build, stagger joints to make it visually appealing. Also, backfill as you go along and make sure to compact the soil so that there is no settling later. Pinterest is full of images of beautiful backyards with creative uses of brick, pavers, stone, and other hardscape products. Do some research, find the bricks you need, and start planning your next project! Whether you are building a retaining wall, adding a patio, or sprucing up a walkway with pavers, we can assist you. Visit our website to see all we have to offer for your hardscaping projects. Nothing ties a home together quite like a brick walkway or patio. Brick and concrete paver outdoor fixtures have a clean and classic look that’s hard to ignore. On top of that, they can boost the resale value of your home while providing you with a functional outdoor space that your family and guests are sure to love. Best of all, you don’t have to hire out an expensive contractor to create a walkway or patio. Here in Southeast Wisconsin, installing brick or concrete pavers is an easy project you can take on yourself. Aren’t sure where to start? Here’s everything you need to know about how to install pavers yourself. While laying brick and pavers can be pretty easy, there is a bit of planning you’ll need to do before you can start. But, once you know what you’re going to do, all that’s left is to gather your tools and start laying brick. The first step to any home improvement project is to draw up a full plan of attack. Before you can even start gathering up your equipment, you should figure out where you want your pavers to go and the shape you want to lay them in. You’ll also need to take the measurements of the area so you can calculate the number of pavers you’ll need to get the job done. Once you have your plan drawn up, you’ll need to stake the area where your paver feature is going to go. Doing this will allow you to do a test run of laying out your pavers so you can get a better idea of how they fit within the space. After you have staked out the location of your new patio or walkway, you’ll need to dig out the foundation. As a general rule of thumb, you want the final hole to be seven inches deep. With the foundation dug out, you’ll now need to prepare the base of your paver project. Fill the bottom of the foundation with roughly two inches of 3/4″ crushed stone gravel. Then, compact the gravel with a vibratory plate compactor, or hand tamper. Repeat this process two more times before moving on to the next step. Sand gives you a soft, moldable area that will make sure your pavers don’t move around while you lay them. All while also helping to lock the units together once they are laid. To make the sand layer, pour approximately one inch of paver sand over the gravel. You’ll then need to level the sand with a smoothing tool or spare piece of wood used as a screed to make sure the surface is completely even. Laying brick and pavers is a bit like completing a jigsaw puzzle—it’s easier if you already know how the final product looks. Make sure you choose a pattern that works with the size and style of paver you chose for the project. Set each paver flat into the sand and tap it down with a rubber mallet. Finally, when pavers are fully laid, you need to sweep in joint sand. You can use regular paver sand or, for less maintenance, use polymeric sand. Pour the sand out over the pavers, and then use a broom to sweep it over the pavers in a back and forth motion until you fill all the gaps between the stones. Once that’s done, you’ll need to sweep all excess sand from the patio, especially if you’re using polymeric sand since it could stick to the bricks. Make sure to follow the specific directions for the type of polymeric sand you are using, as not all polymeric sands are installed in the same fashion. Now that you know how to install pavers, it’s time to get started on your brand new patio. Need some materials to help you out with that project? We can help! We offer a large selection of gorgeous pavers that are sure to make your home look fantastic. Visit or contact us today for more information or to get started creating the patio of your dreams. In only a few months the cool winds and white snowfalls of winter will arrive. Are you ready? There’s probably a lot of home projects you need to do to prepare for the cold season in Wisconsin, but you shouldn’t wait until it gets here to start. Here are some DIY weekend home improvement projects to work on before the winter hits. Winter brings with it many holidays. That means lots of family and friends will be coming through your doors. On the outside, repainting your door and installing new lighting are some top options. If you have a front porch, consider repairing any chipped or rotting wood deck panels. You can also create a beautiful entrance with decorative stone pavers and walkways. There’s no better place to relax and enjoy the cool nights of fall and early winter than around a crackling fire in your backyard. Fire pits are one of the best custom property features. They add character to your home while giving you a great location for roasting marshmallows, playing card games, and sharing stories with friends. Plus, pits can be made in many shapes and sizes, so they can fit in any backyard. Be sure to check out our guide on how to build your own fire pit. If you’re looking for weekend home improvement projects, there’s no better option for both your wallet and the environment than installing energy-efficient windows. During the winter, it’s important to keep the heat in and the cold out. But with older, inefficient windows, that valuable heat often leaks outside while the frigid air creeps in. That means a higher energy bill and an overworked heating system. Taking some time now to install new windows will benefit both your wallet and the world. Just like with your windows, insulation is a key part of keeping your home warm in the winter without burning a hole in your budget. Blowing your own insulation is hard work with a lot of dust, but your DIY efforts can save you thousands off of professional work. Plus, you’ll save lots of money in the long run off your utility bills. Before the winter storms come, make sure your home is sealed and ready for the chilly weather. During the winter months, your gardens and plants face a lot of adversity. One way you can help protect your plants is with a retaining wall. Retaining walls make your gardens more level and provide added structure and support. This helps control runoff and erosion caused by snow and the water that results from it melting. Slightly elevated walls also can make it easier to cover your plants with blankets or boxes, as well as to spread mulch for extra insulation. If you need brick, stone, or other building materials for these or your other weekend home improvement projects, contact us today. We carry a full line of residential brick and manufactured stone products. All of us have heard horror stories about property owners who are watching their investment wash away. Eroding soil from rainwater and storm drains can do tremendous damage to the value of your home. With extreme weather and rising waterways, there has never been a better time to work to protect your property. Those scenic water features can destroy large pieces of land or whole neighborhoods. It’s important in many cases to build a retaining wall before it is too late. But how can you tell if you need one? Here are some reasons your property might need a retaining wall. If you don’t work to control downhill erosion, you will have significant issues on your hands. Without it, on one side of your property you could lose valuable land. On the other side, you could be allowing drainage and damage into your home. And soil could be eroding into the side of your house. A retaining wall is the answer. With a wall, you can head off downhill erosion and keep your property in place. Heavy rains and spring thaws can pose a huge threat to property owners. In many cases, water runoff will carry away your property if not properly managed. Also, water runoff can leave you with a flooded basement if you don’t have a wall to protect you. Too many homeowners water their lawns only to have the runoff damage their homes. Investing in a wall prevents that. If you live in an area with high winds, areas of your property could be prone to soil erosion. This is especially true if your soil is dry. High-speed winds can fly through and—literally—carry your topsoil away. Installing a retaining wall is a good way to protect your soil from wind. They can add valuable space to your home or property. With level land, you can add seating, create walkways, and incorporate stairs. Retaining walls can make your land more usable. An area that is steeply sloped and unusable can suddenly become level, usable space with the addition of a wall. They provide beautiful opportunities for landscaping designs. In many cases, a retention wall can also open up more space for gardening and outdoor activities. When it comes to protecting your property, you can’t be too careful. But it isn’t enough to know that you need to build a retaining wall. You need the right materials for the project. For solid materials that will keep your property in place, trust Champion Brick. We are the preferred Milwaukee brick, paver, stone, pergola, hardscape product, and retaining wall supplier for commercial and residential projects throughout Southeastern Wisconsin. Contact us today for expert advice on your next stone project.